So much about Henrik Fisker’s EMotion concept unveiled at CES this year is both exciting and, for now at least, almost completely untested. Those eye-catching butterfly doors, for example? Fisker still has to figure out how to produce them at scale. He still, also, needs to get a factory. And then there’s the battery, a version of which Fisker says will ultimately have a range of 500 miles or more, though we might not see that one for years. Fisker founded his new company, Fisker Inc., just 14 months ago, after his prior startup, Fisker Automotive, went belly up in spectacular fashion. It was an ignominious ending for one of the automotive industry’s boldest and most renowned designers, the mind behind the BMW Z8 and modern Aston Martins. Based in Los Angeles, Fisker Inc. is Fisker’s comeback bid of sorts, and the EMotion his first reveal on how he might do that. The car isn’t ready for the big time, but it is ready for the bright lights of CES, where Fisker talked up its potential. Indeed, the design is probably the least complicated thing about what Fisker is trying to accomplish, since he says that, eventually, it will be loaded up with every futuristic feature you hear about these days: an all-electric powertrain, Level 4 autonomy, and many, many screens inside, among many other things. And while Fisker, like every other person in the startup game, has kept a close eye on Tesla and its struggles, he says there have been many “lessons learned,” and what he’s trying, indeed, seems to be a different proposition altogether. Tesla aspires to be vertical company, with as much as possible produced in-house. Tesla also strives to be high-volume. But Fisker is trying to be the opposite of that, with plans to produce the EMotion at low volumes and a strategy to work with as many parts suppliers and other partners as makes sense. He also said they have no plans to “build a giant factory,” and instead might buy an existing one or work jointly with another company on theirs. Fisker talked about collaboration a lot in our conversation, and he said he thinks that in the future car companies are going to be collaborating far, far more, in part because of a simple fact about electric propulsion: the engines don’t make any noise. In the past, Fisker said, luxury brands like Aston Martin and BMW wanted to all have their gasoline engines sounding unique. But in our electric future that just isn’t an issue. For now, the promises are pretty big. “Once the technology is fully validated, the battery will deliver a vehicle range of more than 500 miles on a single charge, and charging times as low as one minute –allowing technology to bypass the internal combustion engine and push the automobile into mass electrification,” according to a company press release. Fisker hopes to have the battery in the cars by 2023 at the latest, but concedes that, for now, the technology is far from being done, and might even come in to things like cell phones before it reaches the automotive space. But if it comes to fruition, it promises to be a smaller but more powerful battery than lithium-ion and could, Fisker says, change the game. “We will not see electric cars being totally mass market until we get [a better battery],” Fisker said, and he also might have even been talking about the potential market for the EMotion. The car will cost around $130,000, and Fisker says he’s going after people in the market for a BMW 7 Series or a Mercedes-Benz S-Class. 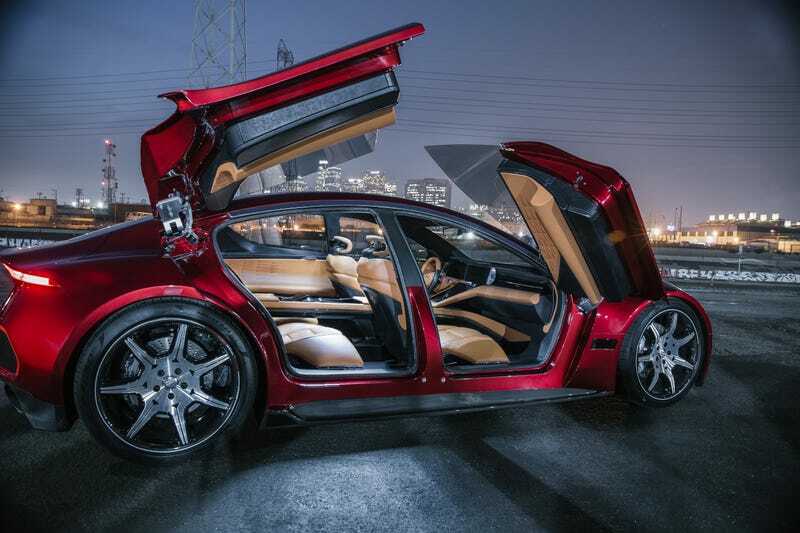 Which brings us back to those doors, since, Fisker said, while they work just fine on the concept for now, producing them at scale is something that still needs to be figured out. “Those are crazy doors and no one’s ever done them anymore,” he said. Though primarily known as a designer, Fisker said he’s learned to love most every part of building a startup.